As if the initial reports about Anders Breivik’s murderous spree in Oslo and the island of Utoya wasn’t enough to make us sick with grief for those innocents who were gunned down and numb with disbelief that such a thing could ever happen, we are now having the drama replayed in the Norwegian courtroom and it makes for distressing hearing. As we remind ourselves that 77 unaware people, unknown as individuals to Breivik, died, it is chilling to hear of his ‘mental preparations’: the deliberate sublimating of any human empathy about his actions. We hear also, how he strolled through the youth camp picking his targets: shooting those close by with a hand gun, and those further away, and swimming in the lake, with a high-powered rifle. There is speculation whether the organisation he ostensibly collaborates with exists: are there other Breiviks out there secretly bearing arms for the Knights Templar? It is doubtful, but then we didn’t know of the existence of the murderous Anders. Breivik describes his rampage as ‘necessary’, and gives as his justification the fact that the youngsters belonged to the Labour Party, and were therefore sympathisers with the multiculturalist cause that wished to both integrate and honour Islamic and other cultures in European society. He spared one man his life because his appearance made him ‘look right-wing’. Now, all this evidence of a seriously damaged and perverted mind builds up and it must be decided whether Anders Breivik is sane or insane. If sane, he is a dangerous terrorist and calculating assassin-this is how he would like to be judged. If insane, we await a diagnosis of what particular illness afflicts him and whether it can be cured and prevented in others. Breivik does not want this verdict, as it will portray him, not as a heroic crusader for white European culture, but as a sad and deeply flawed human being incapable of rational thought and action. Technically, medically and scientifically the jury is out and agonised decisions are pored over by the experts, but to any ordinary person looking on the cold-hearted violence and twisted political posturing Anders Breivik is the very definition of insanity. If not technically insane as an individual, his actions are undoubtedly insane as they contradict every fibre of a right-thinking person’s ethics, morality and humanity. So why the hold up? One statement gave me cause to pause and contemplate the case more deeply: ‘no one’ he said, ‘would have asked for a psychiatric examination had he been a bearded jihadist. Because I am a militant nationalist, I am being subjected to racism’. His implications are clear but complex: if he is insane, then so are all the militant Islamic terrorists. If he is not insane, his actions have the same value as those of other terrorists of whatever persuasion. It is the argument of a relativist…it is the mantra of all modern societies struggling with deep differences of culture, race and religious and moral understanding living side by side: we want to be inclusive and honour all and their beliefs and so we say to all: ‘one person’s beliefs are just as true as the next person’s’ and struggle to find that common ground of practice and belief which is so necessary for a society if it is to live together and have a shared code of what is acceptable and what is not acceptable behaviour in our modern world. Breivik is the logical end product of the thinking that suggests we are each moral and ethical islands entire unto ourself, deciding for ourselves what principles we will live our lives by. It is equally chilling that some infamous paedophiles have used similar arguments to validate their heinous crimes. In short, Breivik’s actions are justifiable to him because he finds them justifiable, no matter how screwed up the thinking. In former times, shared values were more or less imposed on a society by the particular faith that took hold there: our own legal code and judgement on what is right and wrong, is almost entirely based on a Christian view of life and creation and what is acceptable behaviour under God. As the hold of the major faiths loses its grip, we will need to find other ways of agreeing that there are certain things, such as the sanctity of human life and the inviolability of a person’s rights, which are to be shared and commonly held values. For myself, I do not see how that process can either eliminate or marginalise the views of the major faith communities for it is they who have the ancient, inherited wisdom about such things and the wherewithal to help these principles take root in our hearts and the shared mind of our society. However, until we are able to be clearer about our shared values we will continue to chip away, slowly and deliberately at our common good and we will continue to produce the twisted thinking of someone like Anders Breivik. Recent research in the United States has revealed that we humans are naturally optimistic. Believing ourselves to be rational beings who ‘weight up the odds’, take all the factors into account and then proceed to act on good sense, it seems that the reality is quite the reverse. Studies show that, despite external signs to the contrary, we routinely over-estimate how long we may live, believe overwhelmingly that we and our families will remain unaffected by recession and government cuts, lay about in the sun without sun block thinking that it will not affect us and, in a thousand and one other ways, look to the future with hope despite what may happen to us or gloomy signs to the contrary. This phenomenon is called the ‘Optimism Bias’ and it has both good and bad connotations: bad, because it pre-disposes us to take risks that are not worth taking and reason suggests we should avoid. Good, because without our basic optimism the human race would not have the inner drive to succeed in science, sport and business…continents would not have been discovered, books remain unwritten and songs unsung, without our belief that the future is waiting for us and it is a land worth exploring. Hope, it seems, might be genetically programmed into us. The feast of Easter can be said to be a celebration of the optimism bias…it is the ultimate expression of human hope, for it lays out before us the conviction that the death which Jesus endured on the cross was not an end of him and that he was raised from that death on the third day and his disciples came to an empty grave. Looking in from outside a faith perspective this can look like Samuel Johnson’s famous quotation about getting married after divorce…it is ‘the triumph of hope over experience’, for surely death is obviously an end? But I wonder whether that is true, for I constantly encounter people who’s love for a = lost one survives and deepens. I marvel at the way in which the cold death of winter gives way once more to the life and colour of Spring. And how many times have I witnessed the breakup and death of a relationship, only to find that forgiveness and understanding bring new life? In these and so many other ways, new life seems to follow both our little and our great deaths. It might be said that, in the same way that optimism is built into our genes, so death and resurrection is in the DNA of creation and that the hope of being raised isn’t just for the end of our lives, but it is the promise of new life in every situation, encounter and relationship-and that’s as sweet a thought as a chocolate egg in the middle of a sweet-free Lent. Happy Easter everybody. Discussing serious and important issues on a local radio phone-in show is not the best way to do things! This truth has come home to me when I was asked recently to contribute to just such a programme on the topic ‘Euthanasia’. There were some moving stories told on both sides of the matter and the presenter was sensitive, caring and balanced in his treatment of this highly emotional subject. However, I was left with the distinct feeling that some of the deeper and more complex matters surrounding assisted suicide were not being addressed. In trying to address these, I’d like to say two things first: There is a danger that public opinion will be formed purely on the harrowing stories told by those who are in favour of euthanasia; who cannot but have heartfelt sympathy with those whose suffering is deep and untreatable and who does not feel deeply for those who watch their loved ones decline in such a way and who long for that misery to be ended with dignity and without pain? Also, there may be a feeling that the Church and its bishops who ‘pontificate’ on this matter are speaking from their ivory towers, unaffected by the human cost of terminal illness…but we are all human, and we all encounter such suffering. Indeed, my own personal experience as a nurse, as a priest who has waited many times at the beds of the dying and as the member of a family and a son, has served to acquaint me quite closely with such sadness and grief. My own personal view about whether euthanasia should now be an available option is not necessarily shaped by any belief or my faith, although a stress on the absolute sanctity of human life does, obviously, re-inforce an attitude which I believe I would hold even if I were an atheist. And that attitude is that I could not bring myself to agree, at this point in my life, with any legal move to allow assisted suicide in certain cases. Why is this? Well, first of all, let’s be clear what it is we may be seeking to legalise-which is assisted suicide. This is not the right to die, or the right to commit suicide: both of these things are not illegal as the law stands now. Indeed, people in deep distress routinely take their own lives (although my experience is that, when this happens, it is most often accompanied by deep hurt and anguish on behalf of the family and friends who are left behind with unresolved questions and irreconcilable, and unearned, feelings of guilt). The recent case of Gary Speed underlines my point. No, what is being asked for here is the right to be assisted to commit suicide by another party, be it a family member or the medical profession or some other agency. I may hear some say that it would be willingly done by distressed relatives: but someone else also has to provide even them with the drugs or other means of bringing about a person’s passing. It is this involvement of a second and third party in the suicide which causes me, and others, the greatest concern. First, there is the opportunity for an abuse of any law and therefore abuse of the person and their family. It is argued that tightly worded and controlled laws would restrict the action only to those who were truly in need of euthanasia, but such strict and particular enforcement is not, in reality, possible: there is always a ‘creep’ for the provision-witness the extreme legal difficulty in determining when a foetus is viable and sentient or not for abortion. There is widespread agreement that fine lines cannot be drawn quite so perfectly. In the case of assisted suicide, one would encounter similar difficulties in determining when a person was mentally fit enough to decide to die and it would be extremely difficult to prevent the unscrupulous applying emotional pressure on someone ‘not to be a burden’. To allow assisted suicide could be the thin end of a very thick wedge. Likewise, if the medical profession were to be involved in the decisions and execution of assisted suicide, this would fundamentally alter the present relationship between doctor and patient established for aeons by the Hippocratic oath viz. that it is their vocation to save life at all costs. At present, we have relationships of high trust with our medical supporters despite the extremely rare emergence of rogues like Harold Shipman. Is it possible that this trust might be eroded if doctors were responsible for whether we live or die? The weakest in our society would be opened up to greater risk and one can envisage situations where ‘life or death’ questions began to be decided by finance and budgetary requirements. And what about us? It is my contention that, rather than contemplating assisted suicide, we should rather be talking about greater support and help in all its forms for those who suffer grievous illnesses and conditions, and also greater support and help for those who care for them. Often, it is the sheer frustration and anger that ‘nothing is being done’ to alleviate the misery that brings folk to believe there is only one conclusive way to end this suffering. An unintended but real consequence of the availability of assisted suicide would be pressure on those who do not really want to die to acquiesce for the sake of the carers, or on those who actually want to continue to care and support their loved one to believe that euthanasia is the only compassionate way to deal with their suffering. As I said when I started, the subject is complex and vexed with high emotion, but the issues I have raised lead me to conclude that allowing even a small crack in the armour of the law which protects us all in this matter would be disastrous and would undermine our sense of ourselves as an ethically sensitive nation. God knows, an individual’s suffering is a terrible thing and to be viewed with deep compassion, but ‘no man is an island’ and the implications of allowing personal decisions about when we die impact on us all. If you wish to know more about this issue, why not read Bishop Lee Rayfield’s article. Bishop Rayfield is a doctor and former lecturer in immunology. A recent trip to the Far East, to Thailand, allowed me to indulge my interest in oriental religions: specifically Buddhism. A venerable faith, or ‘way’ as its adherents would prefer to call it, Buddhism gives meaning and purpose to the lives of millions of people. In Thailand, there are beautiful temples-akin to our own cathedrals-which dominate townscapes, and in them people silently bow and contemplate the blessings on them of the life of Gautama Buddha before gold statues or beautifully carved and decorated images. Strangely, in a land dominated by this most rational and acceptable of religions, you will also find at every street corner, in every garden and on every field, a standing shrine bedecked with colourful garlands and holding offerings from the people of fizzy drinks, cakes and rice curries. These are houses and offerings of the spirits which inhabit the land. So, to ensure the goodwill of the spirits, gifts are brought to them and prayers for blessing and prosperity are said before them. Some would see this as raw superstition, but other eyes might see that the shrines are a daily and constant reminder that there is more to life than what we can immediately touch and see and that there are greater, more spiritual and eternal qualities to life which play into our world of ‘get and gain’ and of rushing after material well-being. 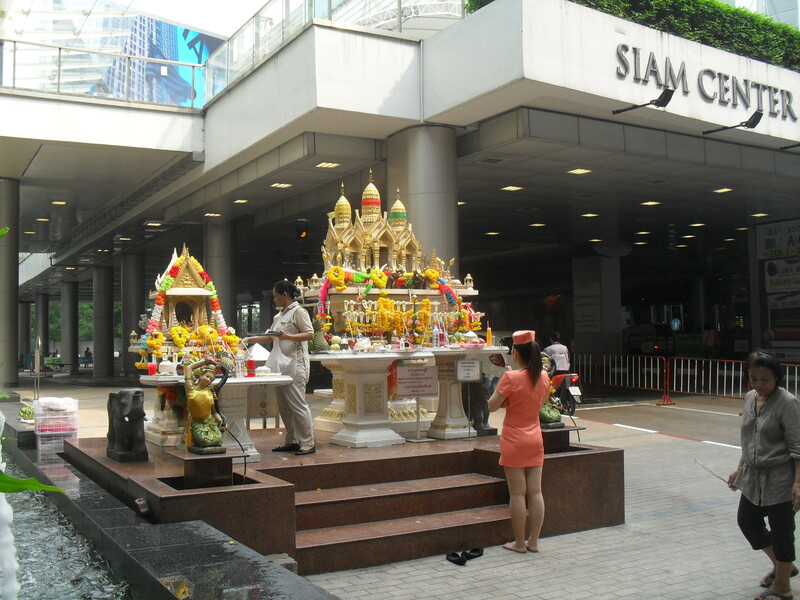 The shrines daily remind the Thai people of the realm of values and meaning. Recently, it has been judged that it is illegal to begin Council sessions with prayer. This has been seen as the thin edge of a secularist wedge. Strangely, I have some sympathy with the ruling for I cannot see the purpose, in any situation, of forcing those who do not share faith, or see the point, to endure offerings to a deity they cannot believe in. However, an alternate view might say that such prayers are part of our own system of ‘shrines’ which are a constant and daily reminder that there are higher values and greater realities in life-what people of faith call ‘eternal’ values-such as justice, the quest for peace, compassion and love and selflessness. The prayers before a meeting are a reminder that it is these values that must inhabit our dealings with each other and not selfishness, self-seeking and personal gain. Well, the prayers may be on their way out…but I do wonder if the values they represent will go with them? Whilst away abroad for a few days a couple of weeks ago, I got a phone call at 2.30 in the morning (the time difference was 7 hours) from the care home that my mother had been in for the past twelve years, Many of the people who read this blog have come to know her through the post on this site that I did called ‘Lost memories of Alzheimer’s’ and others through the radio broadcasts I became part of because of my personal experience of dementia. The phone call was to inform me that Betty was being tended and cared for, and gently rolled from her back to her side to prevent bed sores, when she simply stopped breathing and died. She was 93. Through the miracle of modern communications and mobile phones, as far away as I was, I was able to alert the family and roll into action all that needed to be done at a time like this. After so many years of distressing decline, eventually resulting in mum not being able to walk, talk or in any way communicate with us and after years of drastic weight loss and physical wasting, our natural sadness was also tinged with a sense of relief for her and for us. A blunt and straight talking family, we would often talk of such matters around the meal table and elsewhere and we knew mother’s will that she would not have wanted to live in the condition that eventually overtook her. I have talked before of my disinclination to approve of euthanasia, preferring to continue to care for the person who continued to be our mother and who was living out another stage in her life on this earth. I cling to that view, but now rejoice in the words I once heard from the lips of a former parishioner, who never darkened the door of the church and whose mother’s funeral I was about to conduct. The words were high theology for the daughter said that her mother, who had been aged and crippled and worn, was now free, whole and healthy again-she imagined her now as a young girl. Something of this hope and expectation inhabits my heart and those of my family for, having completed her life on this earth, mother’s pilgrimage to God continues for ‘neither death, nor life, nor things present nor things to come, nor height nor depth, nor anything else in all creation can separate us from the love of God which is in Christ Jesus our Lord’. In a very real sense Mom continues to live in our memories and we find that now is a time to think back over the years and to remember the shared fun and sadness, the mutual learning and the atmosphere of love which the family home had, in no small part due to Betty. And the strange thing is this, that after many years of caring for someone who could not reciprocate that care and concern, our care and concern continues and is not diminished by her physical passing. This one thing alone seems to be a hint of the resurrection that is promised, for all things in life decay, pass away and die but one thing is inexhaustible and eternal and that is love. It is that knowledge which now sustains us. A black and white issue? My letter for the Diocese…. For many years I have sat in the same seat on the Kop at Sheffield Wednesday and, during my time as a parish priest just up the road from the ground, I would be asked by many members of the Sunday school and youth club whether they could come to a game with me and my family. On many occasions, I would be sat with a group of seven or eight football mad youngsters and would get vicarious enjoyment from their excitement. On one such occasion, the match was going well!SheffieldWednesday were winning, the crowd were singing and all seemed well in the world. Suddenly, the opposition equalised via the superbly struck volley of the opposing team’s striker and I was surprised to see the young boy next to me, a young black boy of African extract, rise sharply to his feet and make his way to a steward. A few words were exchanged, and then a man behind us was removed by a gaggle of stewards. Unbeknown to me, my young friend had heard a racist comment directed at the black striker who had scored the superb goal and decided he would act: I’ve not seen the ejected and dejected fan ever since. That young boy, now a strapping man with a first class honours degree in sports science and himself a successful cage-fighter, often reminds me to this day of that incident long ago. In today’s world, it all seems so antediluvian when we hear of such racist incidents but, sadly, we do not have to go too far to be reminded that, as proscribed and publically despised as racism now is, it still lurks just beneath the surface. This reality has, both, come to light recently in the case of the Liverpool footballer Suarez and the subsequent racist barracking of an Oldham player by aLiverpoolsupporter and also in the intimate revelations about the nature of racism during the trial and conviction of the two men found guilty of Stephen Lawrence’s murder. In both these cases, the institutions involved-a football club in one case and the police in the other-have taken all the right steps to try and ensure that such prejudiced behaviour is not systemic and inherent in them. However, the horrible truth is that, in the heat of competition or in the bravado of a deeply disturbed young person’s hateful tirade, the evil of racism still lurks and it is not far from us all. Such racism was not unknown to Jesus: we are told that he stood at the well with the Samaritan woman; a woman from a race despised by some simply because they chose to worship God in anotherTempleother than that inJerusalem. Jesus cleverly extracts from this ‘hated’ foreigner the knowledge that he is the source of eternal life and the eagerly expected Messiah. On their return to the well, even Jesus’ disciples join in the unconscious and implicit racism, being ‘astonished’ that he was speaking with her. In William Shirer’s seminal book on The Third Reich, one is struck by the matter of fact way in which the cremators for the killing fields of the concentration camps were ordered from the manufacturers: as simple as ordering a microwave for the kitchen. Such ordinariness combined with horror is rightly named ‘the mundanity of evil’. My young friend in the football match was right to challenge that thoughtless and cruel barb by a fellow supporter for there must be link between these small, mundane, acts and the kind of racism that leads to violence and loss of life? In the end, the real tragedy of racism is that it de-humanises those we parody and to whom we attach simplistic prejudices. It was the ‘hated’ foreign woman at the well who saw the deep mystery of Jesus and his divinity: when our eyes are clouded by colour, class or creed we fail to see and enjoy the true beauty of the person underneath. I was born a cynic and have always found it difficult to believe in certain things which others find perfectly reasonable. Ghosts-certainly as the continuing presence of the dead-leave me cold and I fear that I am not amongst those who are convinced that aliens have visited the earth. Numerous visits to the Holy Land, however inspiring and educational they are-and they are-served to help me question whether this or that place really was the actual site of the Resurrection or the nativity of Jesus: the tarot cards and seaside fortune tellers seem to be no more than harmless entertainment, and horoscopes and astrology are just plain silly. It’s unusual then that, as a young person, I took quite a deep interest in the Shroud of Turin. It all stemmed from an article in a magazine in the late 1960s about the Shroud which explained its mysteries and ended with a full colour recreation of Christ on the cross: a three-dimensional representation based on the two-dimensional image on the cloth-it is an image which was on my student room wall and which I still have to this day. In truth, the Shroud is fascinating: how did the image get there? Why is it in negative? Why did it harbour spores from plants only found in the Jerusalem district? Why are the marks of the nails through the wrists not the hands? These, and many more, ‘quirks’ create the mystery of the Shroud and have spawned many books, investigations and outpourings of faith. Despite recent studies which seemed to suggest the cloth is medieval and the fact that the only contemporary shroud that has been found is nothing like that behind the altar in Turin Cathedral, there are still those who cling to the belief that it is the authentic winding cloth of Christ. And lo and behold, the scientists have come out in support: the conclusions of the recent Italian study suggest that the image of Jesus found its way on to the cloth via an intense burst of ultra-violet light. All attempts to re-create the Shroud using technology available in the middle ages have failed, for the ability to create this intense beam did not exist for many more centuries. So what’s going on? I must be clear and explain that I still believe the Shroud to be a human creation, made well after the crucifixion of Christ, but I remain intrigued; for such artefacts undoubtedly feed faith. But how and why? I wonder if it is because objects like the Shroud of Turin, the holy blood of Bruges and the countless pieces of the true cross or spines from the crown of thorns feed the imagination? When we are faced with a relic, regardless of its authenticity, we are urged to reflect more deeply about what they represent, what events they recall and what deeper and eternal truths lie under the ‘accidents’ of the small, perishable remains. In short, such relics help us enter more deeply into the mystery of life and the events of faith-they stir our imaginations. And this is where we part company with the scientists, for they wish, quite rightly and properly, to define and explain a physical cause for all things- the ‘theory of everything’ which we hear Brian Cox and others talk about. The eye of faith, on the other hand, believes in the endless impenetrability of the mystery of existence. We can scientifically explain the biology of reproduction and the physicality of human regeneration, but the love which underpins human relationships is an undefinable, limitless and ongoing mystery which defies explanation and encompassing and is constantly offering new experience and fresh layers. Here is both the meeting point and the present dividing point between the language of science and the experience of faith: the one suggesting all is, eventually, explainable; the other that mystery is forever evolving. So, if the Shroud was finally proved to be, or not to be, the authentic cloth in which Christ was laid in death after his crucifixion, then this one fact would serve to work against what such objects of faith are about…for it would cease to inspire our imagination about just how great and ungraspable creation is. At this time of year, we enter once more into the stories about the birth of Jesus…wouldn’t it be a shame if it was ever proved beyond a shadow of a doubt that they were all literally true|? For our encounter with the limitless mystery of existence would be at an end. I wish you a holy and wonder-full Christmas!